So news that Prince William has recently added a £250,000 Bentley to his garages is likely to make him the envy of many fathers-to-be up and down the country. The Flying Spur, which the Duke and Duchess of Cambridge will use for high-profile official engagements, is one of the world’s fastest saloon cars with a top speed of 200mph. But it’s hardly economical, costing £118 to fill up and managing just 19 miles to the gallon. As for special features, the hand-crafted walnut interior, the champagne cooler and the wi-fi internet capabilities are more luxuries than purely practical. William and Kate are also understood to have opted for quilted leather seats which heat up and have a massage function. Safety features include bullet-proof windows and super-hardened steel armour, contributing to its hefty three-ton weight. The couple were pictured in the Bentley last week as they arrived for a reception at the Natural History Museum in London. It is being leased privately from Bentley, a common arrangement for official cars used by members of the Royal Family. 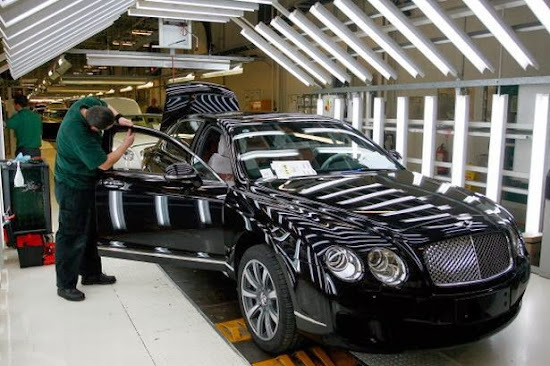 Bentley boasts two royal warrants, from the Queen and the Prince of Wales, and in 2002 gifted the monarch with her state limousine to mark the Golden Jubilee. Neither the car maker nor Kensington Palace were willing to discuss how much the Cambridges’ deal is worth or whether they have been given preferential rates. The cost is being met by the Duchy of Cornwall, which funds the official work of Prince Charles and his family. The couple were given one of the first Flying Spurs off the production line, six months before it was made available to the public. Before it was delivered, engineers at the firm’s headquarters in Crewe fitted the car with ballistic steel plating, triple-glazed 1.5in bullet-proof windows, tyres that stay inflated even after being punctured, and a loudspeaker system to ward off attackers. Vulnerable areas, such as the engine bay, radiator and fuel tank were also given extra cladding. According to sources, another leased car, a Jaguar, will be used for more low-key events. The couple also have a fleet of leased Range Rovers. All of the cars are shared with Prince Harry. Last September Prince William announced that he was giving up his military duties to concentrate on his life as a working royal, meaning the Bentley is likely to be dusted off more frequently in the future. A Kensington Palace spokesman said: ‘The Bentley is being leased by the Duke and the Duchess of Cambridge and Prince Harry for official engagements, which is no different to any other member of the Royal family.